"Everest Base Camp (EBC) is one of the most popular destinations for first high altitude trekking. This route offers a perfect blend of physical challenges, breathtaking views, extreme weather, amazing local culture, and a lifetime experience. Given that this is a serious trek, it is recommended to plan everything in advance, from route, clothing and gear, high sickness and insurance. Even with advance planning, a lot of uncertainty remains and so, the best way to ensure a safe and enjoyable trip is to take the help of a local expert. I was lucky to have Chandra Shor as the guide for our team. In short, we couldn't have asked for more... he was the perfect guide for this great adventure. From pre-trip briefings, valuable suggestions in completing our kit with essential gears, to patiently answering all our inquiries - Chandra 'Dai' (older brother) gave us confidence and a sense of assurance even before we started our 12+ days of trek. 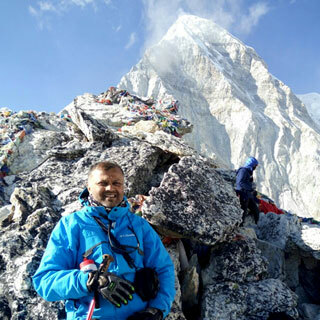 However, it was during the trek that I realized how valuable Chandra Dai's experience and expertise was to our overall experience of this trek. His meticulous planning of the trekking route, time management, attention to detail, safety, and managing evacuation of sick trekkers while never missing the big picture always impressed me. I have trekked in different parts of the world and this was my third trek to EBC and I soon realized that Chandra Dai was the finest guide with whom I have had the privilege of joining on a trek. During this trek, he not only continued to lead us safely, but he was also very friendly and reliable. We learnt a lot about the traditional culture, stories of the mountains, and about his experiences. Chandra Dai is also an accomplished mountaineer himself (he has summited Mt Everest in addition to other famous peaks in the Himalaya). His long mountaineering experience brings a perspective to planning and leading expeditions which is simply first class.